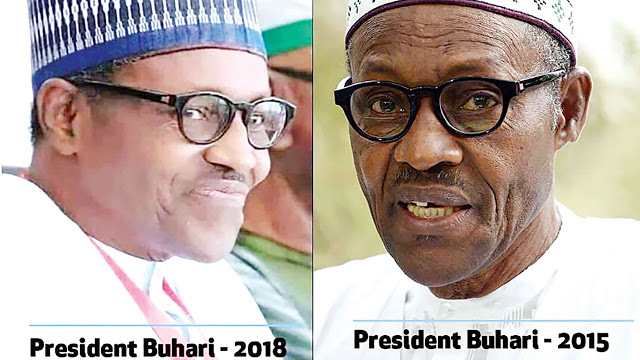 Focus; Difference Between Late Buhari and Impostor Jubril. Nigerian government runs on lies, fraud, and deceit, Owing to the fact that Nigeria has a fraudulent foundation which now brought corruption to this British company ltd called Nigeria. After the colonial rule of Britain, they handed over the mantle of leadership to the north; And the "Born To Rule" ideology of the northerners emerged; Till today, Nigeria is still flowing on the fraudulent leadership of the cow brained northerners. Late Buhari, a Fulani northerner, was rigged into power in 2015, He couldn't complete his 4year tenure due to his ill health, he finally died on Jan. 27-2017 in London Hospital; The news of his death is still hidden from the weak minded, self-centred Nigerians, as plans to retain power in the north is being carried out. Buhari, a supposed man of 75yrs old, having a shrunk and shrivelled face and hands, is now being impersonated by a young vibrant man of barely 45-50yrs old by name Al' Aminu Jubril from Sudan. Despite the overwhelming evidence and the undeniable facts presented by Mazi Nnamdi Kanu, leader of a Nigerian separatist movement IPOB, concerning the identity of the man ruling them now, many Nigerians choose to defend ignorance. Africans, most especially Nigerians are daft; They have a brain, but can't make use of it; They only believe lies because they are not truthful to themselves. Nigerians, you don't need Jesus Christ to come down from heaven and tell you that the man in Aso Rock ruling you and affairs of Nigeria is not the Buhari you know/voted for in 2015; The Buhari you voted for, died on Jan 27th, 2017 in London hospital and was flown to Saudi Arabia where he was secretly buried. The pictorial and video evidence is enough for your eyes to have opened to the truth as rooted and presented to you by Nnamdi Kanu and IPOB. To clear the air, Let's look at some difference between the late Buhari and the impersonator currently in Aso Rock. The Buhari you voted for in 2015 speaks Fulfude(Fulani native language), but this impostor can't speak it because He's not a Fulani man; He's from Sudan. (If He can speak Fulfude, let him come out and address Nigerians with the language, or hold a presidential chat or debate.) Late Buhari has a bald head, But his double(Jubril) have a complete set of hair on his head because he's still a young man; That's why he can never remove his cap/hat, neither can he wear an outfit that doesn't require the hat/cap. (Remove your cap to prove me wrong) Late Buhari has shrunk and shrivelled face and hands, But Jubril has fresh hands and face because He's still a young man. Late Buhari is 6ft tall, But His double(Jubril) is a bit shorter. Note; In 2015/16, Buhari was taller than Saraki, but in 2018, Saraki is now taller than Buhari. Late Buhari has a congenital mark on his left earlobe, but this present Buhari has a flat earlobe. (Zoom his ears and compare if you doubt me). Late Buhari appear often in public and address Nigerians, But this new version of Buhari is hiding from the public because he knows that He's an imposter, and he was advised to stay indoors till Feb 2019 election so He will be voted out, and Atiku will replace him so, nobody will know the story. Late Buhari is left-handed, but this present Buhari(Jubril) is right-handed. Nigeria is a country of savages, where anything can happen. Those who are proudly Nigerian, you have been deceived a lot, its right time you stand up to your feet, use the pictorial evidence and facts that have been given to you, make your research, confirm it, and thank God for Nnamdi Kanu and IPOB for exposing the greatest fraud/crime of this 21th century; And stop defending ignorance.